29 September 2010, at 10:33a.m. 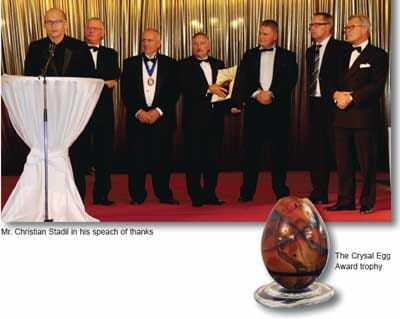 CZECH REPUBLIC - The Sanovo Group of companies has been awarded the prestigious Crystal Egg Award at the 2010 International Egg Conference held in Prague. At the Gala Banquet last week (23 September), the trophy was presented to Christian Stadil by Frank Pace (IEC Chairman). Sanovo's presentation was given by Mr Stadil, the owner of Thornico, which included the Sanovo Group of companies, during the Showcase for Marketing Eggsellence. The presentation highlighted the company's efforts within Corporate Social Responsibility (CSR) on a global scale. Sanovo Group has launched 'Company Karma' as their CSR version 3.0. Through Company Karma, Sanovo now has the ability to make an impact in the communities where they do business, improve living standards as well as an opportunity to implement environmental change. Mr Stadil explained: "The challenges of over-population, that it took the human race 60.000 generations to reach a population of around six billion, and that with the current population growth it is going to take us only one generation to reach nine billion, and following our industry's role in feeding said population, do good and grow our businesses at the same time is one of the biggest opportunities we have. "In the Sanovo group of companies, we work from a 'four times win' notion where we aim at creating value for our four most important stakeholders – these being our company, its employees, our partners and customers and last but not least, causes we believe in – where we can make a difference or to use a big word, the world. "In the Sanovo group of companies, we aim at making CSR-company karma an overarching core value in our companies and not just a thinking that is isolated in the marketing, HR and CSR departments. This thinking should live through the whole company and should be integrated in the way we think, behave and act. "As the world becomes smaller and smaller, more and more transparent the things we do, say and maybe even think will have a consequence. "This added interdependence in the world one can choose to see as something negative or as we think we should, as something positive – as a way of combining doing good with doing well." concluded Mr Stadil.